They had me at the bread. The first thing set down at dinner are thin slices of a long cold-rise sourdough wheat-and-quinoa loaf that are warm, wheaty, and chewy, served with a smear of creamy whipped vegetable butter, which is sweet, and lobster-roe butter, which is mildly salty. 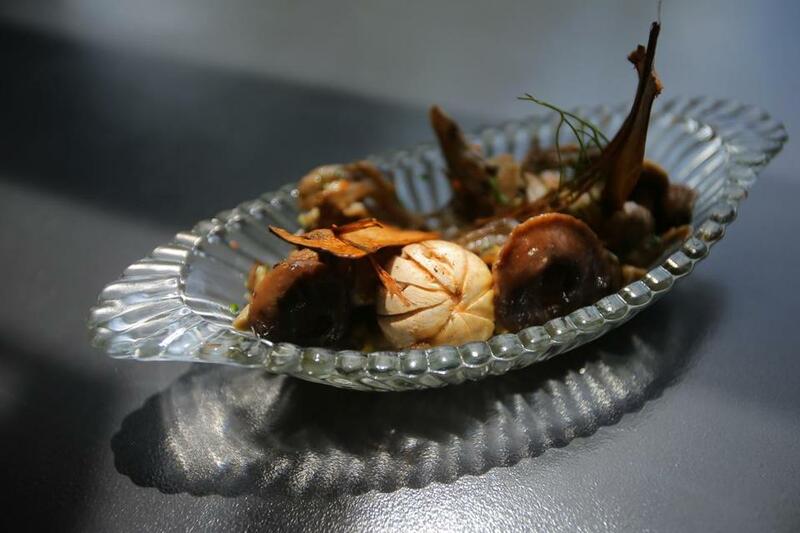 Everything at Juliet is like this: little surprises tucked into a dish, familiar tastes you can’t quite pinpoint, a lot of technique that manages not to be show-offy, or even obvious, except that it makes things irresistible. 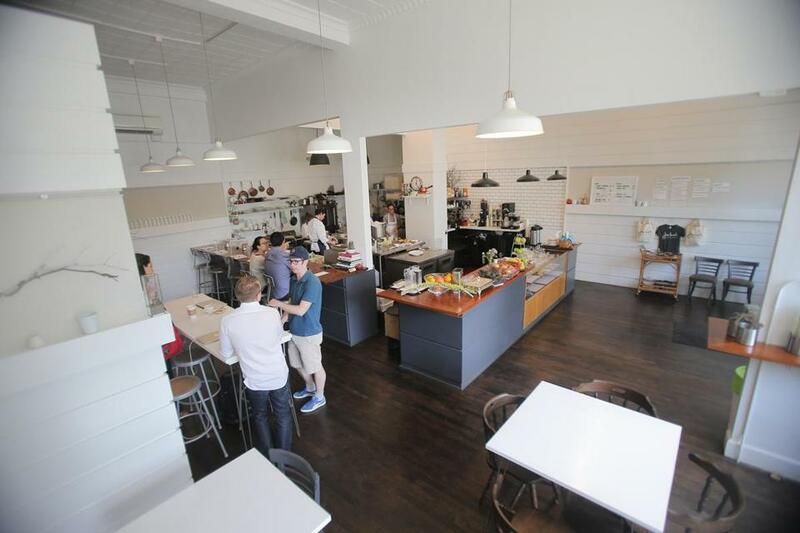 Juliet — which opened in February and offers dinner Thursday through Saturday, breakfast, and lunch — is owned by Joshua Lewin, 31, and Katrina Jazayeri, 27 (see related story), who are also a couple. They claim they do not sleep on cots at the back of the restaurant, but they seem to be there all the time, he stirring buttery eggs early mornings, roasting fish late at night, she busing, serving, and greeting customers over breakfast tartines or after-dinner espresso. In the center is a large open kitchen. A small counter overlooks the cooking area; these six stools are for a la carte walk-ins (others diners reserve for a prix fixe menu). A liquor license was recently approved by the City of Somerville and will go into effect within a month. Old (some wobbly) and new chairs are tucked under half a dozen tables. The place is very light and white. Branches hang on wire filament on the wall. Someone’s mother’s silver-topped rectangular chafing dish sits on a counter, fashionably unpolished. If a film crew needed a set for the opening of a romantic comedy, they could come here. It happens to be in Union Square, but it could be in any hipster corner of any city. 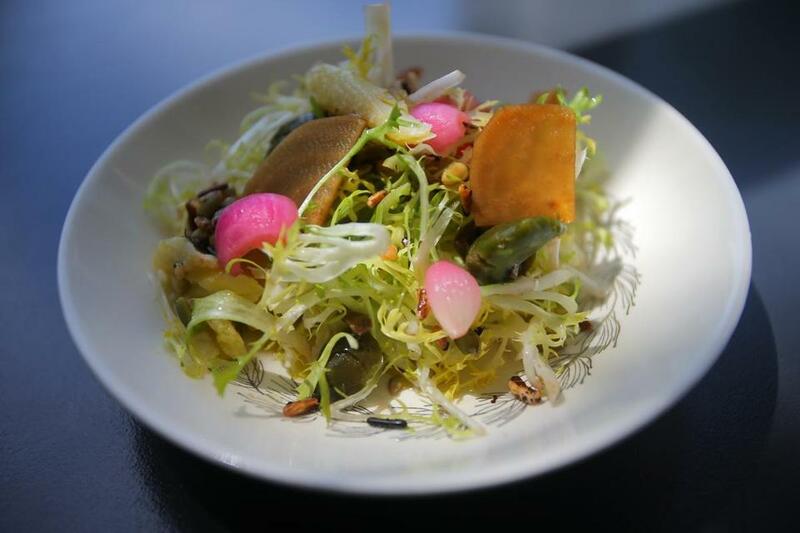 What follows the bread at one three-course prix fixe is an asparagus salad that feels like a box of clever tiny gifts. Spears are roasted and raw, the uncooked pieces very thinly sliced, arranged on the plate with pickled cipolline onions, ramps, a poached egg, saffron-meringue foam, and a generous sprinkle of seeds and puffed grains. Pay attention or you’ll miss a delightful detail, a little crunch, something aromatic, or a spill of rich, soft yolk. Then comes “Bloody Mary” on a spoon, a taste of some of the drink’s key elements, with a little spice. It’s a play on the fact that the place isn’t yet licensed to sell liquor and so is offering mocktails, like a soothing minty “mojito.” Later in the meal there’s a small salad with bites of peppery mizuna and other unusual lettuces and dots of fried capers. The interior of Juliet, a restaurant in Somerville’s Union Square. 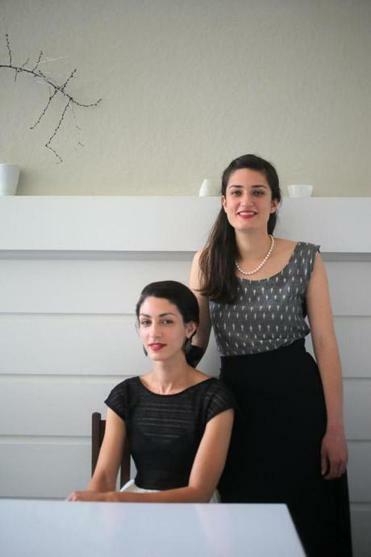 Over the past few years, Lucia and Katrina Jazayeri have become integral and respected parts of Boston’s hospitality industry. 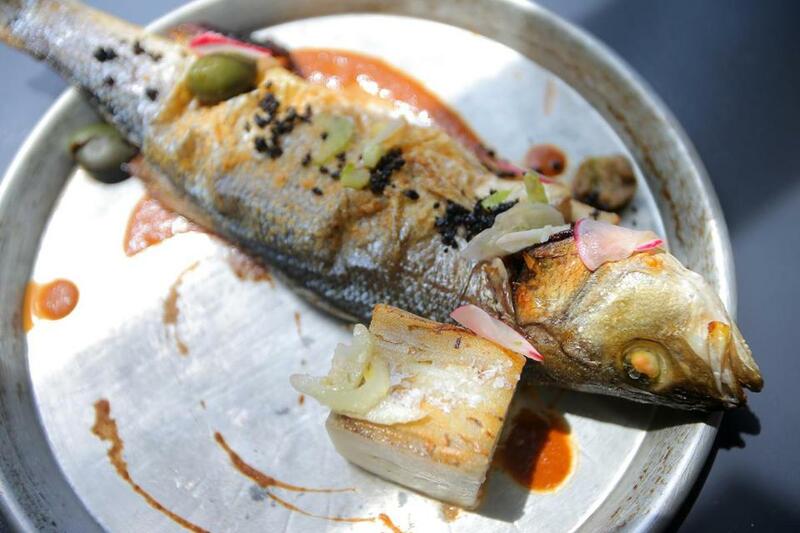 Roasted branzino with head, tail, and bones is the centerpiece (you can get the fish filleted). There’s a square of potato mille-feuille, a savory take on the French confection, crispy outside, buttery inside. The fish flakes with the touch of a fork, and is garnished with caramelized lemon, strips of fennel, smashed green olives, lots of fresh herbs, and the Catalan sauce romesco. Nothing on the platter — which is sometimes a cheap pizza pan, sometimes a nice white oval — overwhelms the sweet fish. Not the salty olives, nor the mildly acidic lemons, nor the intense red pepper sauce, because Lewin’s strength isn’t only his creative flair but his sense of proportion. We are one of only a few tables, so even though we’re dining on three courses, we get a fourth (all the tables seem to), a dish of wild mushrooms in creamy brown butter, which includes hen of the woods, shiitakes, buttons carved into fans, king trumpets, and enoki, like proud hatpins poking out of the pile. Topping the dish and adding more texture to the aromatic blend is a mixture of curry leaf and breadcrumbs and a tiny mirepoix of barely cooked carrot and celery. For dessert, cherry clafoutis is a firm square that tastes like a dense crepe rather than an eggy pudding. A grandmere’s farmhouse clafoutis would have closed the meal on a higher note. Whole branzino at restaurant Juliet in Somerville’s Union Square. When we return for five courses, there are many more tiny tastes in little spoons and cups, like bright yellow saffron soda in old-fashioned punch glasses. The house fruits de mer that begins the menu offers little bites of the sea, including marinated wild Chatham mussels, baked mussels, branzino preserved in chile oil, and saffron mayo. We reach for more of that wonderful bread, and there isn’t any; some magically appears as if a server is reading our minds. The staff is cheerful and helpful. You never know who will bring your food. Sometimes one of the cooks comes to the table. Lewin himself sweeps by several times (I think he’s trying to see if he knows me). The owners instituted a One Fair Wage policy, and a note on the menu says tips are not necessary. 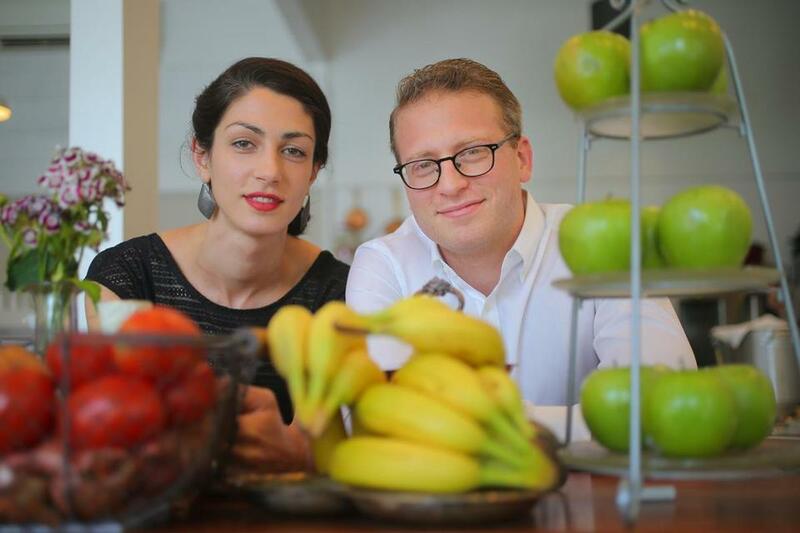 Katrina Jazayeri and Joshua Lewin own Juliet, a restaurant in Somerville’s Union Square. At breakfast, tartines are on super-thick slices of toasted pain de mie, layered with enticing combinations such as avocado, grapefruit, radishes, shaved fennel, and a sprinkle of pimenton. Spanish potato tortilla suffers from being stone cold, but homemade chips with it are salty, crisp, and exceptional. Local Stone & Skillet English muffins form the base for sandwiches, but they’re doughy and not toasted enough. Slow-scrambled eggs with a bit of lemon rind, piled on the rounds, are perfect with Spanish jamon. A deliciously jammy bell pepper and tomato confit is stirred into an inviting piperade, which comes with the toast. Everything in the pastry case looks like something you know, but not quite the way you’ve seen it. A scone is gigantic, unappealingly flat, but the melting texture is wonderful, and tender ricotta-fennel buns, which aren’t sweet, are a revelation with their cheesy centers. 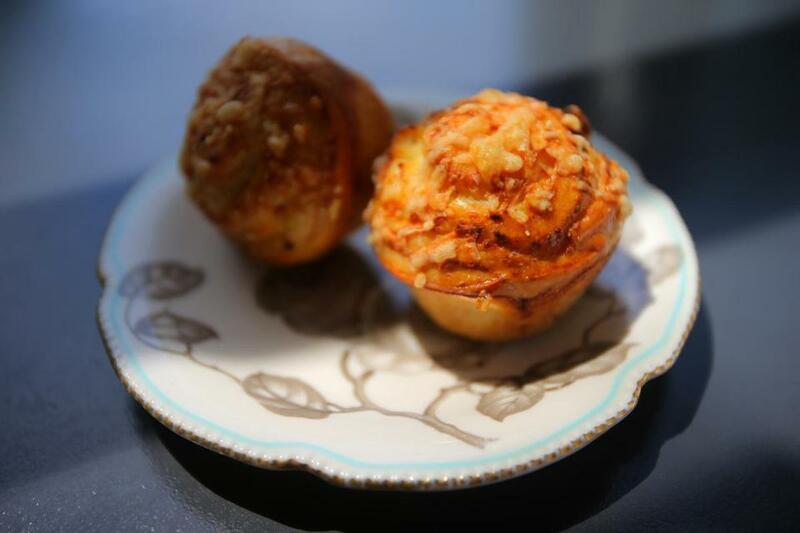 Ricotta fennel buns at restaurant Juliet in Somerville’s Union Square. Banh mi at lunch is almost too rich with pork pate, avocado, slaw, and all the pleasurable heat and crunch of the Vietnamese sandwich. Creamy chunks of lobster are voluptuous tucked into a brioche roll. Andalusian gazpacho with bell peppers, local tomatoes, sherry vinegar, and olive oil is plain but lively. Even a salade Nicoise, with chunks of tuna, a soft egg, frisee, smashed olives, pickled red onions, and seasonal vegetables is far from the popularized version but winning in its own right. Lewin, a former Marine who was raised in Agawam, was the chef of Beacon Hill Bistro. Jazayeri was manager of Belly Wine Bar and the Blue Room. He seems to be keeping an eye on every single diner, but it’s earnest rather than overbearing. She moves through the open space like a gazelle. In the film, they’ll play themselves. Nicoise salad at restaurant Juliet in Somerville’s Union Square. 257 Washington St., Union Square, Somerville, 617-718-0958, www.julietsomerville.com. All major credit cards accepted. Wheelchair accessible. Prices Breakfast $3.50-$9. Lunch $7-$18. Dinner 3-course prix-fixe $55, 5-course $78, a la carte items $6-$49 (includes tax and tip). Hours Breakfast Mon-Fri 7-11 a.m.; Sat-Sun 8 a.m.-3 p.m. Lunch Mon-Fri 11 a.m.-3 p.m. Dinner Thu-Sat 6-10 p.m. Noise level You can hear your tablemates, but not your neighbors. What to order Piperade, avocado tartine, scones, ricotta buns, salade Nicoise, gazpacho, three-course or five-course dinner.